Out of load? You need to borrow a load for emergency purpose using your Touch Mobile sim? Can't request for Share a Load? 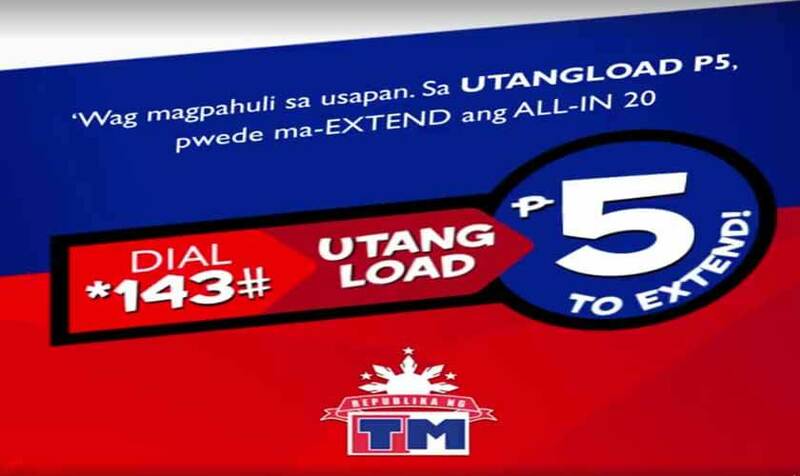 No need to worry as Tm offers a variety of options that you can avail in their UTANG load service. You can use this even if you have zero balance in your account as long as you have good quality network signal on your phone to be able to send the promo code. This is very useful to those who needs to connect online, urgent matters to inform, special message to send and other important purposes. With your TM prepaid, they have all the answers for your communication needs, even if you’re stuck on traffic or no load retailers available in your location. Another good news to all TM subscribers is that you can now use the UTANG LOAD5 to extend a promo like All-In 20. If you want to know all the available promos in TM UTANG load you can browse their offer using *143# menu using your mobile phone. Do note also that payment for this offer will be deducted on your next reload plus the service fee.